Autumn is one of my favorite seasons! I can smell the apple dumplings, hear the leaves crunching under my feet, and see the vibrant autumn colors everywhere. It's truly a season for the senses and is perfect for play. My girls and I enjoy savoring the happy harvest season in many playful ways. Gorgeous leaf colors are a highlight of autumn, so we always plan a few hikes through wooded areas. I often use a fall scavenger hunt checklist that helps my girls observe nature, enjoy the colors, and spot wildlife enjoying the abundant harvest, too. Local orchards in our area encourage customers to pick their own apples. I appreciate the opportunity to show my girls where our favorite autumn fruit comes from, support small businesses, and have fun. 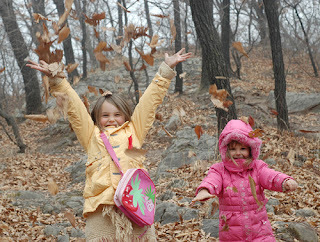 We have a big tree in our backyard, and every year, we rake the leaves into a pile and spend hours jumping into it. When my girls were young, I'd toss a toy into the pile and challenge them to find it. They get so much exercise playing in the leaf pile! Pumpkin-carving is a tradition in our home. We even hold a contest to see who can carve the most unique design. Need ideas? Let your kids carve their favorite cartoon character or the family pet. They can also color, paint, or apply stickers to the pumpkins. And don't forget to save the seeds and toast a tasty and healthy treat! Collecting and preserving leaves inspires creativity, hones fine motor skills, and encourages your kids to appreciate nature's beauty. We've pressed leaves and made homemade wrapping paper, hanging mobiles, and leaf wreaths. What projects might you make with your preserved leaf collection? I didn't bob for apples until I was in college, and I was determined that my kids would enjoy this fun activity before they reach adulthood. Every year, we bob for apples. It's a fun activity that always leaves us laughing and provides a crisp, tasty, and healthy snack. Molding clay or play dough is a fun activity my girls enjoy year-round. When autumn comes, we head outside and mold leaf bowls. They learn more about the science of leaves, symmetry, and art, and we have fun. Cooler evening temperatures invite your family to start a campfire and enjoy an evening in nature. You can roast marshmallows, tell scary stories, or chat about your favorite autumn activities as you laugh, talk, and bond. Last year, my girls asked if they could host a small harvest party for a few neighborhood friends. It turned into a big block party with seasonal dishes, games, and crafts, and we're already planning this year's celebration. Go meet your neighbors and have fun with your own neighborhood harvest party. Autumn is one of my favorite seasons. In our home, we savor autumn with these playful activities. What does your family do to enjoy a happy harvest?